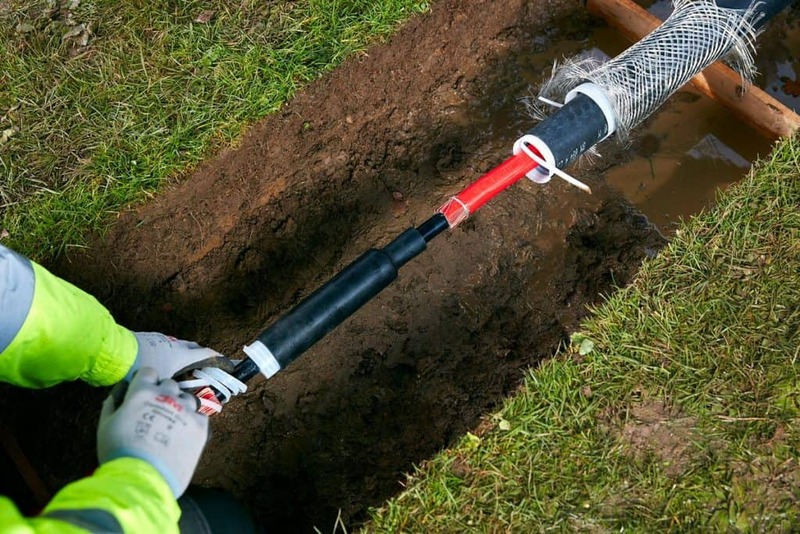 When installing cables during the cable pulling procedure it is common for accidental cable sheath damage to be inflicted upon cables – if left unrepaired the tears in the sheath allow water dampness and moisture into the cable penetrating and compromising electrical performance. Excess mechanical strain, abrasion or compression caused by backfilling cable trenchs can also cause cable sheath damage which should be effectively repaired using heat shrink cable repair kits. Exceeding the bending radius of LV-HV cables and where cables are laid into trench under tension along cable rollers can similarly cause cable sheath damage – to avoid cable damage exact minimum bending radii for specific cables can be found in the information sheets of the cable manufacturer. 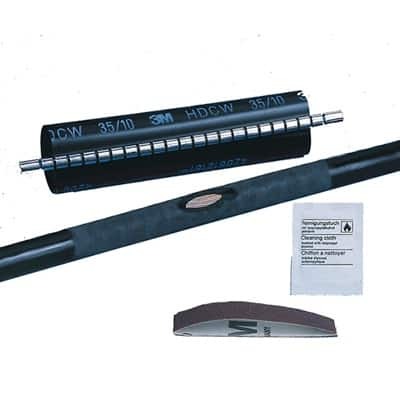 3M HDCW series heat shrinkable wraparound sleeve kits are suitable for cable sheath repair and jacketing sleeves – including heat shrink cable repair, cold shrink cable repair, 3M Scotch electrical tape and insulating resin based repair solutions for low and high voltage cables. Suitable for use with cable joints and as an additional corrosion protection on undamaged cables. Cable repair and cable sheath repair kits are available to repair damaged power, control and instrumentation cables including oil, gas & petrochemicals, offshore & marine, mines & quarries, rail & tunnels, distribution & transmission, building services, street lighting, renewable energy, airports, port authorities and utilities. 3M HDCW kits are simple and quick to apply using heat shrink torches maximising protection against mechanical stress even in the most aggressive environments. 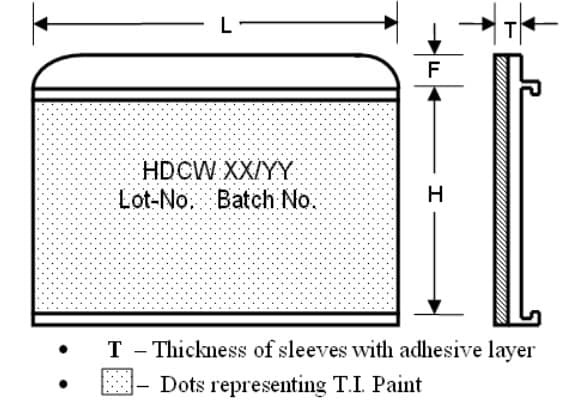 HDCW kits are made from modified cross-linked polyolefin which is weather resistant and has a hot-melt adhesive coated to the inner side of the sleeve. The outer surface is coated with a thermochromic paint, which changes the colour after the optimal heat shrink temperature is achieved. 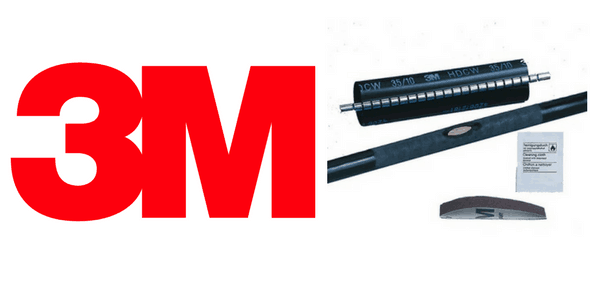 3M’s cable sheath repair kits are made from halogen free materials. Upon heating, the heat shrink sleeve shrinks and the adhesive melts, thereby achieving a safe and watertight bond between the sleeve and the cable. A corrosion proof metal clip is then used to fully close the sleeve around the cable sheath to repaired. Where “hot-working” is not permitted due to atmospheric presence of flammable gases in potentially explosive atmospheres and hazardous area locations Cold Shrink tubes can be used to repair cables where access is possible to the open-end of the cable circuit – not suitable for repairing cables mid-circuit or mid-span. If a flexible repair to cable is required we can provide 3M Scotchcast resin based cable repair solutions specified for marine and offshore with excellent resistance to seawater environments, submersion and exposure. Thorne & Derrick International have worked with Stena Drilling to satisfy several demanding offshore cable repair applications. Stena’s drillship fleet required reliable and high specification power cable and control cable repair solutions. The recommended cable repair solutions were for use on NEK TS 606 / IEC 61892-4 cable standards (flame retardant-halogen free-mud resistant) for use on board drill ships operating in Arctic conditions. 3M HDCW heat shrink cable repair kits reinstate cable sheath integrity caused by oil mud, heat, mechanical and general electrical service damage in offshore cable installations. NEK 606:2004 was the Norwegian industry standard for the Offshore Oil and Gas, Ship & Marine Industries until withdrawal in 2009 – today IEC 61892–4:2007 is the superseding European standard now in place. These cables are DNV Certified to be in accordance with ISO 9001 and 14001. The NEK 606 cables are flame retardant to IEC 60332 and when a mica glass tape is applied over the conductors then are classified as fire resistant to IEC 60331. NEK 606 are standard electric cables for offshore oil, gas and marine industries and for use in power, instrumentation, control and signal applications. This part of IEC 61892 specifies requirements for the choice and installation of electrical cables intended for fixed electrical systems in mobile and fixed offshore units, including pumping or “pigging” stations, compressor stations and exposed location single buoy moorings, used in the offshore petroleum industry for drilling, production, processing and for storage purposes. The construction of NEK 606 cables are similar to other standards (such as BS 6883 and IEEE 1580 type P), however variations in the construction relate to the insulation, screening, braiding, bedding and sheathing compound. The conductors of NEK 606 cables are constructed with circular tinned stranded copper wire to IEC 60228 Class 2 or Class 5. NEK 606 conductors are insulated with either an EP or HEP rubber compound and comply with BS 7655. NEK 606 conductor insulation colours differ also from BS 6883 and IEEE. NEK 606 compound for the Bedding and Outer Sheath is SHF2 which is a Thermosetting Dual Compound LSZH and Flame Retardant and also Oil/ MUD Resistant. NEK 606 armoured cables have a tinned copper wire braid, excellent for mechanical and corrosive protection. Standard outside sheath colours for NEK 606 are Black for Power and Control, Grey or Blue for Instrument, Red for Medium Voltage. NEK 606 instrument cables are individually or collectively screened with a copper mylar tape in contact with a tinned copper drain wire. ➡ Should you require customer service or technical support on the selection or specification of LV MV HV Cable Accessories please contact us – view the full range of 3M HDCW Heat Shrink Cable Repair below.